The stories are true! Heat pumps really are one of the most efficient and cost effective heating and cooling solutions for homes. Unfortunately, for Seattle homeowners the story isn't that simple. 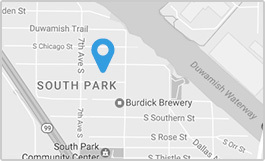 While Seattle's climate is probably the most ideal in the country for heat pumps, there are numerous obstacles to heat pump installation in the city. Seattle's neighborhoods, including West Seattle, Ballard, and Queen Ann, have some of the most stringent noise codes in the country. This is great for keeping our neighborhoods quiet at night. Unfortunately, heat pumps, while super efficient, do create sound just like any other mechanical equipment. Most standard heat pumps are not able to meet the noise limitations set by Seattle code, especially when combined with the very narrow lot lines common to our neighborhoods. The closer the heat pump is to the lot line, the quieter it has to run to meet Seattle code. Additionally, standard heat pumps and air conditioners, shaped like a tall square box, have a large physical footprint, making it tough to fit one one on many Seattle properties. Typical Ballard, Seattle property, with narrow lot lines and limited space for a heat pump or air conditioner. As a Trane Comfort Specialist, Evergreen Home Heating and Energy communicated with Trane and our distributor, Gensco about the limitations of standard heat pump and air conditioner models in Seattle. Fortunately, Trane listened. Evergreen worked closely with their engineers over a couple of years of development and testing, and the result is a new heat pump model, the XV19. Evergreen was also given the first XV19 to install and test earlier this year in a Ballard Seattle home. We were able to provide a central heat pump with air conditioning to a homeowner who wouldn't have been able to have one installed otherwise. The installation went great, and the XV19 has performed superbly. Evergreen Home Heating and Energy's installation of the first XV19 in Ballard, Seattle. The XV19 operates with sound levels between 43 and 57 dBA, which is extremely quiet when compared to other industry models, which typically operate between 72 and 76 dBA. This quiet operation allows the XV19 to fit into most Seattle single family home properties, including West Seattle, Queen Ann, and Ballard. Specifically implemented with Seattle in mind, the XV19 comes with the ability to enable quiet mode. Quiet Mode limits the compressor's speed to ensure it won't exceed Seattle's noise limits at the property line during quiet hours, and can be customized for the XV19's location on any property. This allows the unit to continue to run, but only up to the maximum speed that won't exceed noise limits at night. So, even if the property is extremely space-limited, quiet mode allows us to install the XV19 almost anywhere and meet noise code requirements, as well as keeping surrounding neighbors happy! This creates the possibility for many homes to have high efficiency air conditioning and heating installed that previously weren't candidates for a heat pump or air conditioning unit. Trane has designed the XV19 from the ground up to reduce the size and physical footprint of the unit. This allows the unit to fit almost anywhere on a property. And, because the fan now faces sideways (side discharge) instead of up, it can be installed underneath decks, opening up further placement possibilities. Heat pump efficiency is measured by 2 different ratings. The SEER rating measures cooling efficiency, and the HSPF rating measures heating efficiency. In Seattle, the HSPF rating (Heating Seasonal Performance Factor) is the most important of the two ratings because of our weather pattern throughout the year. The XV19 has an HSPF rating of up to 12, significantly higher than Trane's previous high of 10 HSPF. With an XV19, you can expect extreme savings on your energy bills, depending on what type of system you currently have in your home. 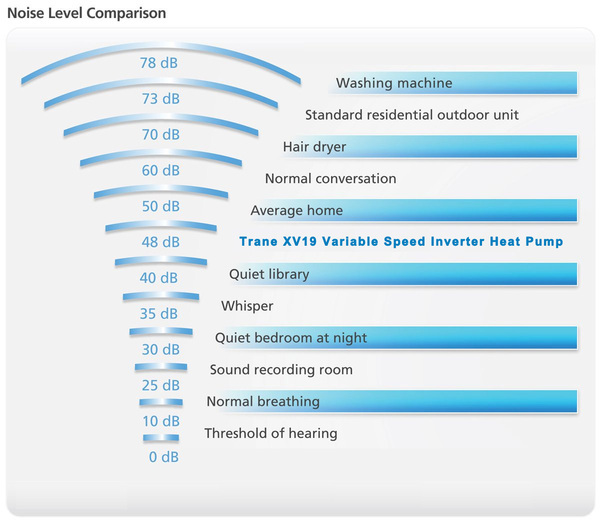 The XV19 heat pump is a variable speed system. This allows it to run at the exact speed and power your home needs to stay comfortable, even as outdoor temperatures fluctuate throughout the day and year. Because variable speed systems are running at the lowest speed possible to deliver exactly how much heating or cooling your home needs at any given time, they typically run slower, for longer periods of time. This allows air to be circulated for longer in your home, evening out temperatures. It also reduces air flow noise to almost inaudible levels most of the time, and allows the system to run at optimal efficiency throughout the day and night. The Bottom Line: The XV19 is a Great Central Heat Pump and Air Conditioning Option for Seattle Homes! The XV19 is not only designed to fit anywhere, it is designed to deliver maximum comfort and efficiency with a very small physical and aural footprint. It will keep your home comfortable without taking up all of the space in your yard, and allow you and your neighbors to enjoy peace and quiet both inside and outside of your home. It will also save you a ton of money on your utility bills. To find out if the XV19 is a good fit for your home, give us a call at 206-565-1455 to schedule a free appointment. We'll come out to your home, take measurements and determine whether the XV19 or any of our other solutions will work well for you. We also have financing available. Give us a call!